UK, 2009, 92 minutes, Colour. This is a documentary about the environment and the seeming indifference of individuals, societies and governments in the face of global warming and disasters like Hurricane Katrina. We are living in the age of stupid. We are the stupid. Whether that will entice non-believers in climate change to see the film or whether they will be still in their seats when the lights come up... possibly, no, probably, not. This is a film that preaches to the converted, reinforces the beliefs and standpoints of the converted. The film-makers have tried a device to make it more audience palatable. After a quick image gallop through time from the Big Bang to 2055 when the world and its population have been almost destroyed including a visual overview of evolution, we are introduced to a survivor who has built an enormous electronic archive safeguarding all human achievement. It is a huge tower in the now unfrozen Arctic. He becomes our host as he goes to his screen and shows us footage from our own times that ought to persuade anyone who observes realities that times and climates are changing. He makes pessimistic comments, he makes pointed accusations. At the end, he offers some hope while suggesting that, if we don't make significant moves, 2015 will be the crisis point, the point of no return. Pete Postlethwaite as the archivist is solemn and, not without reason, sepulchral in his utterances and warnings. With the present footage, he shows an elderly mountain guide in Chamonix who remembers when there was a lot of snow. He takes an English family hiking on the disappearing glacier. This family has become a pioneer of conscientious response to climate change. They, fortunately, have the means and leisure to control their lifestyle. The husband is an advocate of wind turbines and fights a losing battle with the inhabitants of Bedford who don't want their view spoiled but are still in favour of environmentalism (for others, it seems). Hurricane Katrina features prominently as well as an oil rig engineer who stayed in his home during the crisis, lost everything but ferried a hundred people to safety. He speaks on behalf of the social outreach by the companies. In the meantime, we move in and out of the developing world, meeting a rich Indian who establishes his own cheap flight airline in India in 2005 and is aware of the enormous carbon footprint. On the other hand, and much more disturbing, we move in and out of Nigeria, where a young woman aims to study as a doctor but is trapped in a continually impoverished area where Shell drills – which leads to government financial corruption, neglect of infrastructure for health and education (often allegedly for fear of kidnapping of personnel). Which means that the lecture on climate change is too didactic to change attitudes despite the facts and the alarming prognostications. It is always, in films, the stories and the emotional response which sets audiences on the path to reflection and change. 1.The significance of the theme? Climate change, global warming? The impact for an audience? The film as a visual lecture (one critic calling it a hectoring lecture, a ‘hecture’)? 2.The visuals of the film? The future, the Arctic and the lack of snow, the pylon with the archive? World achievement? The archivist? Pete Postlethwaite and his sombre presence? His addressing the camera, warnings? His screen, able to move images around? Drawing on the archive of images? 3.The prologue, the credits, the Big Bang, the rapid showing of dates, the millions of years, evolution? Bringing the human development in the context of animal life? The present? 4.The use of footage, disasters, interviews? How well used? Persuasive? (1) The guide in the alps, his age, his reflecting on snow in the alps, the English family, hiking, the disappearing glacier? (2)	The English family, on holidays, their return home, their having the leisure and means to check their carbon footprint? The father and his involvement in wind turbines? The Bedford situation? The inhabitants and their hostility, the turbines spoiling their view, their still being in favour of the environment? The campaign against him? The arguments? His engineering, discussions with the farmer who was in favour? His losing the case? (3) The oil rig engineer from New Orleans, staying in his home during Katrina, rescuing his father, rescuing and ferrying a hundred people to safety? The visuals of Katrina and the information? His losing everything? The background of his work, the rig, his emphasis on the social outreach by the companies? His retirement, fishing? 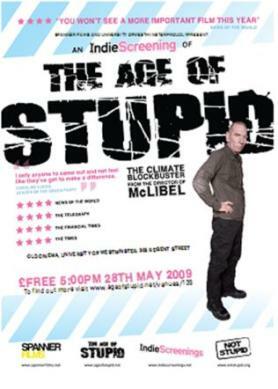 His observations about climate change? (4) The wealthy Indian, the establishing of his airline, for cheap flights? The contrast with the information about flying and carbon emissions? India 2005, a genial man, yet severe and demanding with his staff? The documentation, the political fights? Training the staff, buying the planes? The opening of the airline? The initial flight? (5)	The effect of Shell, the young woman wanting to be a doctor, trapped in poverty, life in the delta, the unfinished buildings, the company’s promises to help? The neglect of the infrastructure? Health and education? Financial corruption? Abductions? 6.The overall impact of such information? The witnesses? The statistics? The critique? 7.The implications of the title, ourselves as stupid, not heeding the warnings? The information about 2015 as the climax point? 8.This kind of film preaching to the converted? The possibilities of its influencing non-believers?